Aviara debuts a new brand, a new boat and a new business paradigm with its AV32. 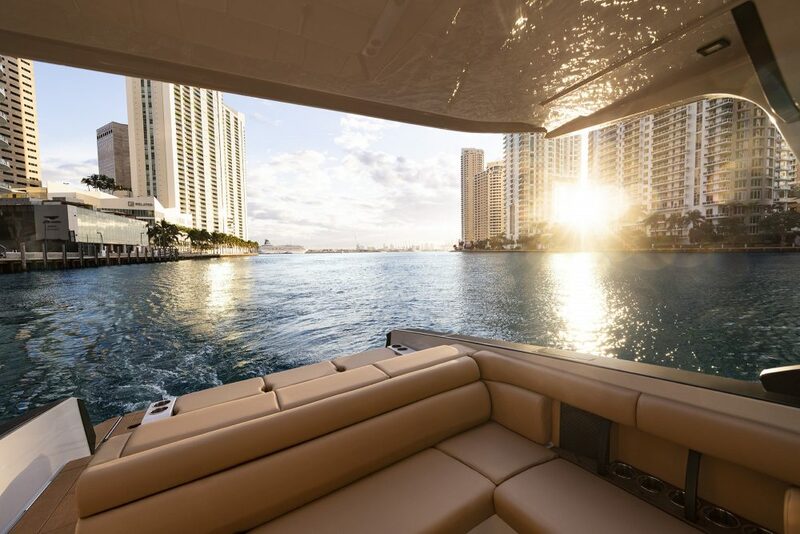 Billed as a progressive luxury day boat, the new Aviara AV32 is a joint venture between the MasterCraft Boat Holdings and the MarineMax chain of boat dealerships, and it made its debut at the 2019 Miami International Boat Show. It presents a fascinating blend of a new model, a sound marketing plan and a proven builder. 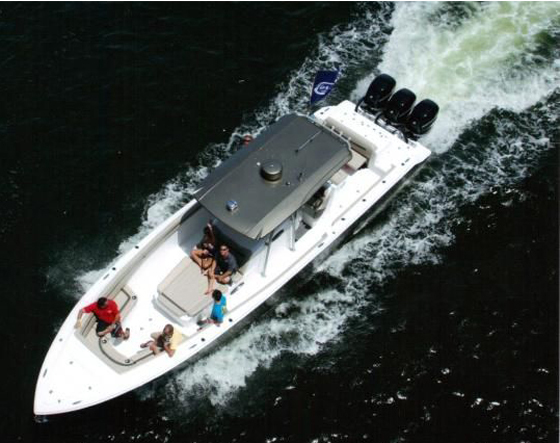 The boat came as a result of market research on the part of MBH and MarineMax. The AV32 fills a sweet spot in the market. Aviara’s future will depend on larger models. At the debut, Aviara offered free champagne to the journalists in attendance, which should be part of every sound marketing plan. 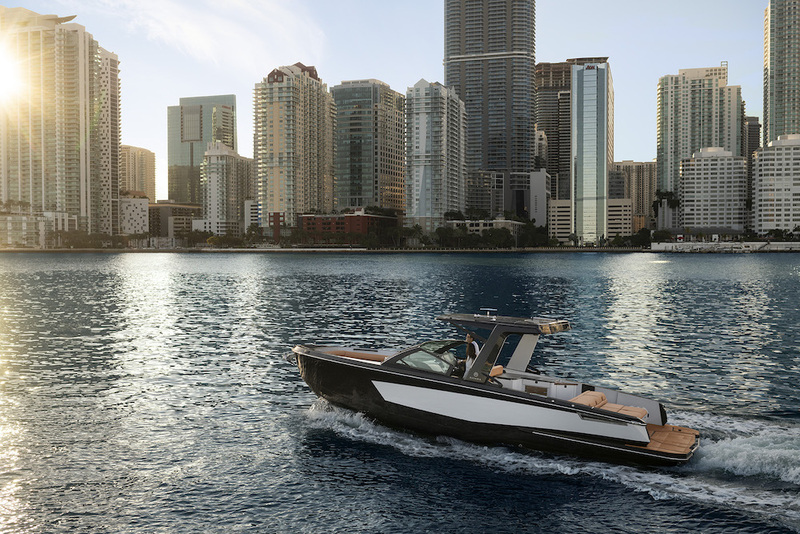 The new 2019 Aviara 2019 is a new breed of day boat. 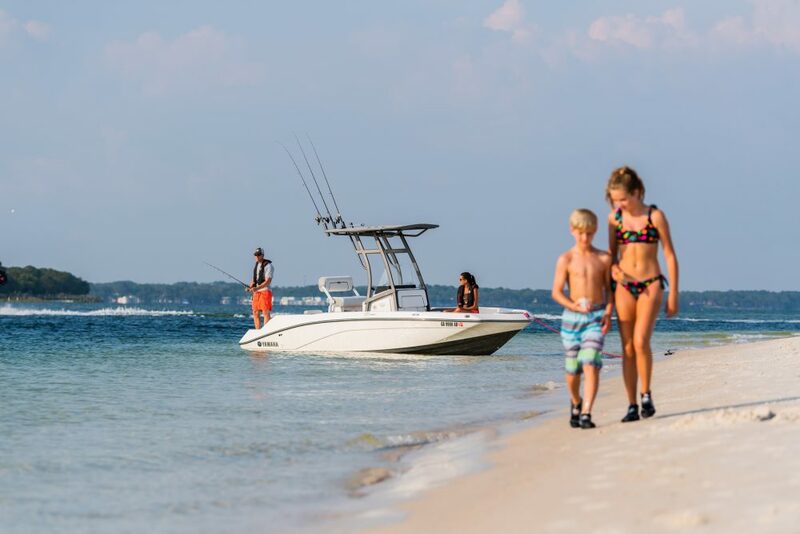 The AV32 is one model, but it’s available with twin sterndrive power from Ilmor marine or twin outboard power from Mercury Marine, so it’s a little like introducing two boats in one. The outboards are available in 300 and 350-horsepower models, and the Ilmor V8s pack either 380 or 430 horsepower apiece. 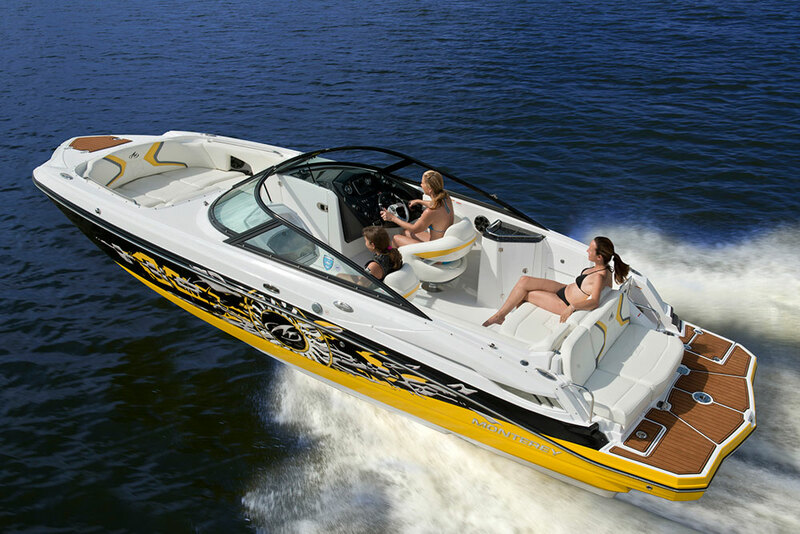 Both models will be built in MasterCraft’s facility in Vonore, Tenn. The outboard version comes standard with Mercury’s Joystick Piloting system, which lets you forgo the pesky throttle and gear levers so you can dock using the methodology you learned playing Pac Man so many years ago. Buyers get a choice of seven primary and hull-accent colors, and two more on the hull bottom and hardtop. 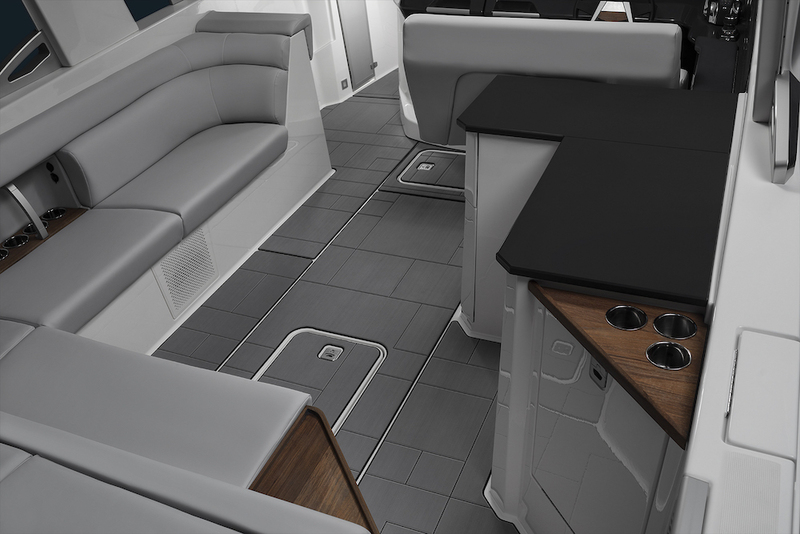 Upholstery options are equally luxurious, with a choice of four colors and two for the SeaDek foam on the swim platform and cockpit. 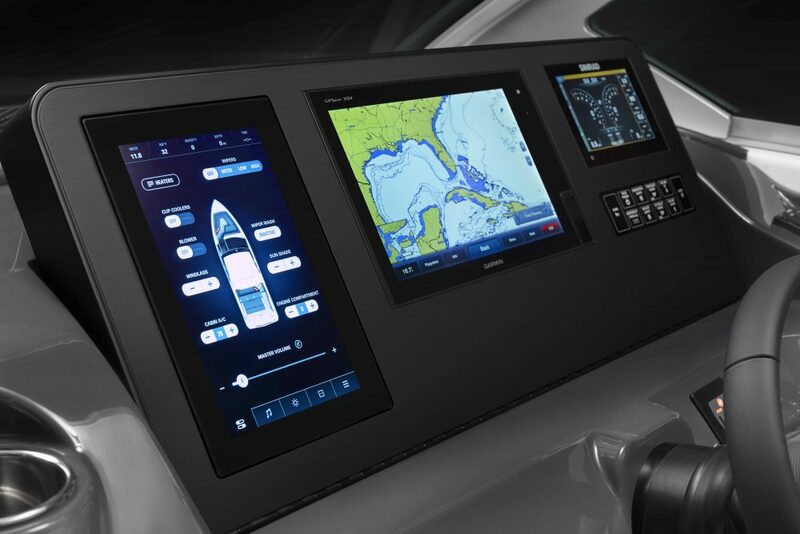 What’s more, most boats offer simply stainless-steel windshield frame, which is fine because it withstands the harsh marine environment, but the AV32 comes with a billet aluminum windshield frame in silver or black satin. The grab handles, cleats and other metal trim items are done in a matching metal. It’s a nice choice to have. 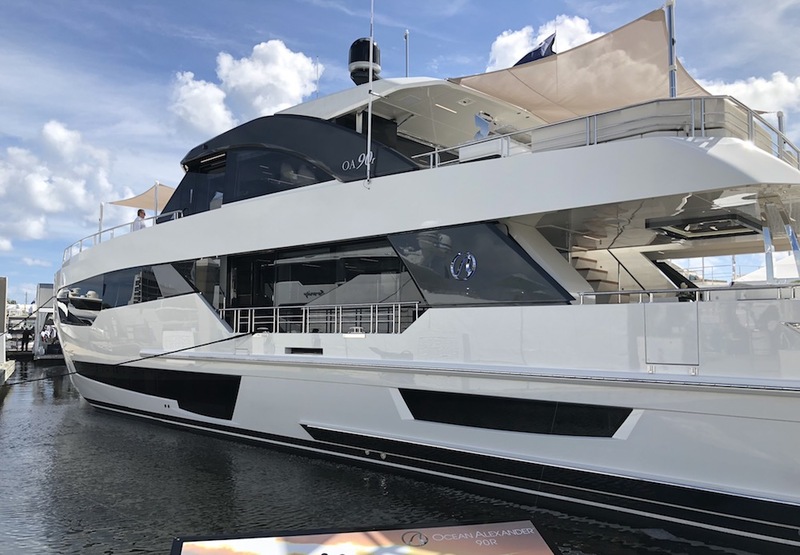 The hardtop is standard, but you can add options to make the AV32 even more yacht-like, such as a full canvas enclosure and a shade system that telescopes electrically from the aft edge of the hardtop. The AV32 includes some innovative and interesting features onboard. For example, the rear sunpad is nearly full width, and it has flip-up backrests to create rear facing seats. It also comes with “barstool” seating. Simply put, the “headrest” pads between the rear, inward-facing lounges and the aft facing lounges pop up on pedestals to create seating that resembles bar stools. You won’t find seating like this on anything else on the market, but it’s not clear how useful it would be. SeaDek foam flooring runs through the boat, with an abundance of space in the cockpit for seating and storage. 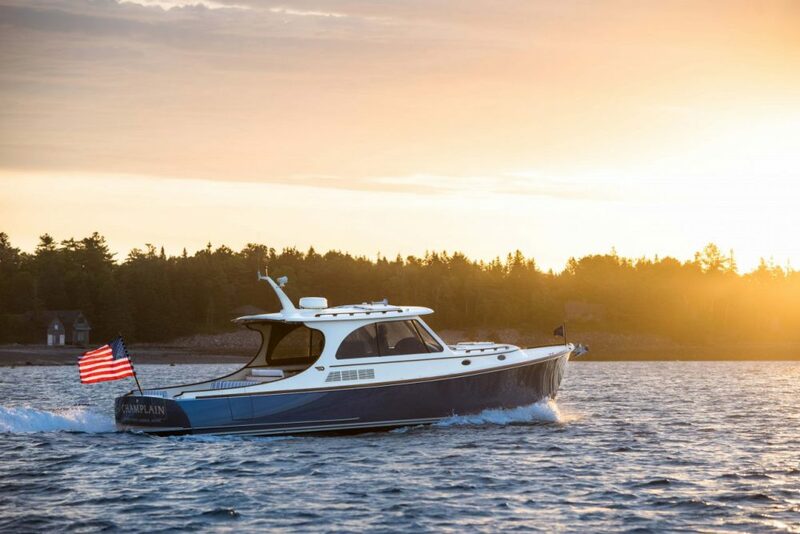 To access the swim platform, passengers have a generous walk-through with SeaDek foam flooring and a stowage compartment underneath that has built-in wells for fenders. The swim platform itself features a hydraulic swim step that lowers into the water and adds a place to sit in the water and provides the same function as a swim ladder. Are you ready to get behind the wheel of a new model for a new brand? There's no better choice than the Aviara AV32. 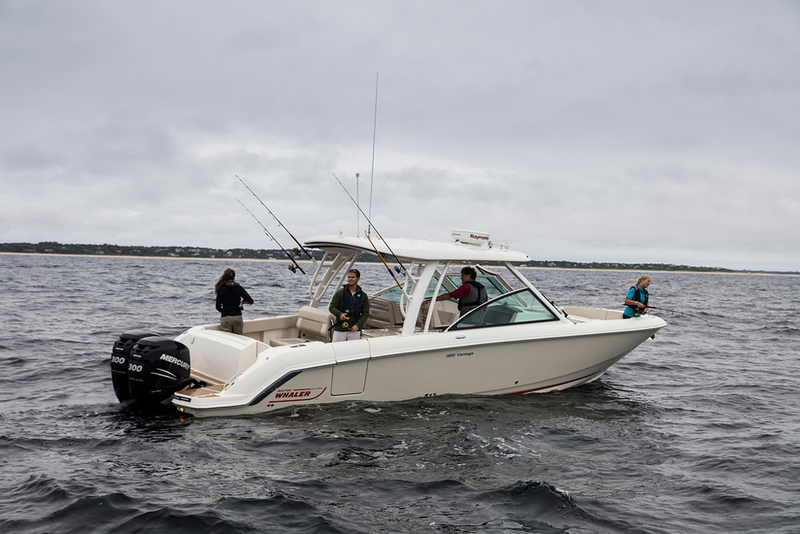 For the driver, automated trim tabs, docking lights and Mercury’s Active Trim are available as an option, as is a windshield wiper with a washer system. If mere cupholders aren’t enough, you can get cooled cupholders at the helm—which keeps that champagne chilled on hot days. There are also options for a stainless-steel refrigerator and a wet bar, and a barbecue grill. Options such as the battery charger and gel batteries are handy for when the boat is not in use. When it is in use, the transom shower and anchor windlass will make the days more enjoyable, which is what boating is supposed to be about. The Aviara AV 32 will be available exclusively through MarineMax dealers, the nation’s largest recreational boat and yacht retailer. Inventory will become available July 1, 2019 at MarineMax stores across the country.